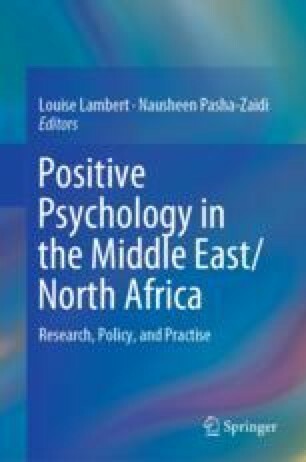 In 2015, we launched the first issue of the Middle East Journal of Positive Psychology with the intent of developing an indigenous positive psychology across the Middle East/North Africa (MENA) region. We felt it was imperative to do so, not only to counter the indiscriminate use of Western positive psychological models and interventions in the region, but equally, to encourage the growth of this new science of wellbeing by offering a platform for regional research to be showcased. As our work grew, it became clear that more was needed to help the field prosper; in particular, a focus on science was missing with many consultants speaking louder than academics and setting the dominant tone for the field by focusing on the “positive”, but overlooking the “psychology”. This book grew out of those concerns. In it, we offer a variety of chapters across the many growing domains of positive psychology, such as positive education, positive organizational development, positive clinical psychology and positive health. We also take a look at a number of growing themes in the field, such as the use of Big Data, the building of happy cities, and the use of happiness research to inform national policy to name a few. In this manner, we explore what makes life meaningful, worth living and what leads to conditions of social, national and individual flourishing. Diener, E., & Diener, C. (2017, March 31). Governments testing wellbeing initiatives: A call for psychological scientists to get involved. APS Observer. Retrieved from https://www.psychologicalscience.org/observer/governments-testing-wellbeing-initiatives. Poppe, G. M. (2017, September 13). Positive psychological interventions in the treatment of schizophrenia: A systematic review of the effects of positive psychology on wellbeing and symptoms of people with schizophrenia. University of Twente, Netherlands. Retrieved from https://pdfs.semanticscholar.org/5132/74adae6c93cd874a17313f56cefb933265cd.pdf.